Influenced by national accreditation mandates, teacher preparation programs are beginning to examine more carefully the assessment and instruction of preservice teachersâ€™ professional behaviors and dispositions. We conducted a pilot evaluation to examine the outcomes of specialized instruction regarding professional behavior for preservice teachers in special education. The evaluation employed field setting supervisor ratings for each of eight preservice teachers. Field supervisor assessments occurred at six points during the semester. Four students were assigned to a special section of a normally required seminar in which we explicitly taught characteristics of basic professional behavior. Four other students were assigned to a typical seminar associated with the field experience offering didactic instruction alone about professional behavior. During specialized instruction students read, discussed, and authored their own hypothetical case studies about preservice students, and they rated the cases using both a faculty developed Professional Behavior Assessment (PBA) instrument and rubrics. Field supervisor ratings using the same PBA instrument did not clearly support one training approach over the other. Preservice teachers, however, reported that the discussion and rating of case studies provided a much clearer understanding of professional behavior. 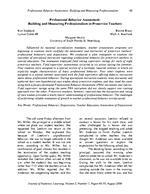 The challenges of performing reliable evaluation of growth in teacher professional behavior are discussed. Submitted by Brian McDonald (bmcdonal@oswego.edu) on 2006-09-02. Made available in DSpace on 2006-09-02T14:27:45Z (GMT).